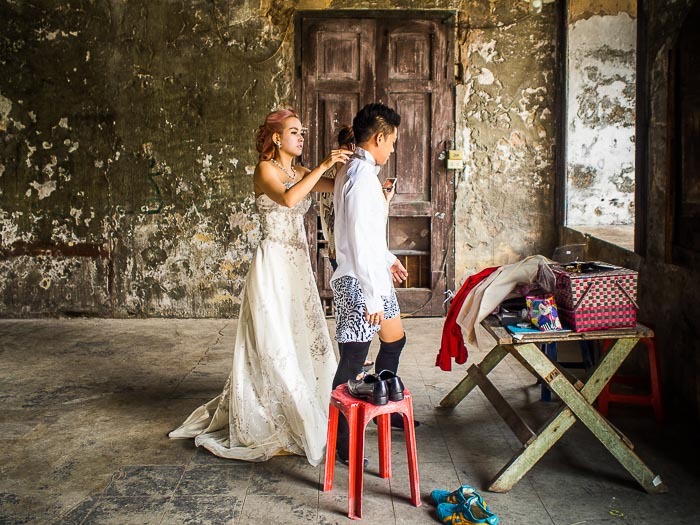 A couple gets ready for a pre-wedding photography session at the old Customs House in the Bang Rak district of Bangkok. The building is popular with Bangkok wedding and portrait photographers - it offers lovely light and a richly atmospheric setting for photos. I went down to the old Customs House Tuesday morning to see what was happening with the historic old building. 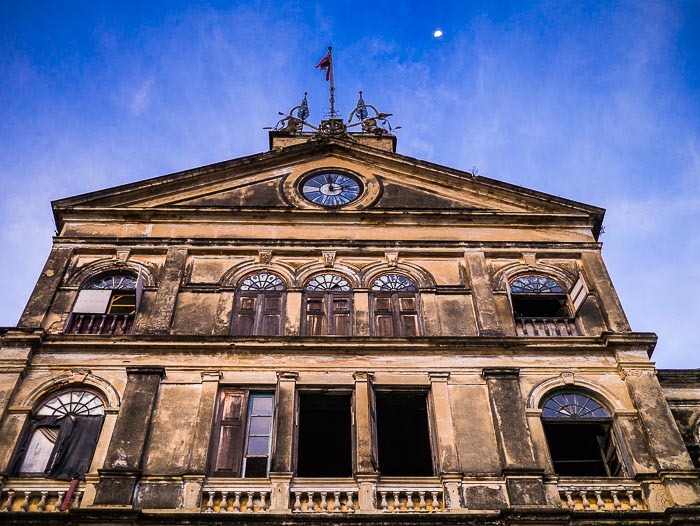 The old Customs House was designed by an Italian architect and constructed on the Chao Phraya River in the 1880s. The Chao Phraya was Siam's gateway to the world then and the Customs House one of the most important buildings in Bangkok. The customs offices moved when the port moved from Bangkok to Khlong Toey (still in Bangkok but several kilometers downstream from the central Bangkok waterfront) in the mid 1950s. The old, beautiful Customs House was shuttered. Eventually the Marine Fire Department, responsible for fighting fires on the river moved into it. 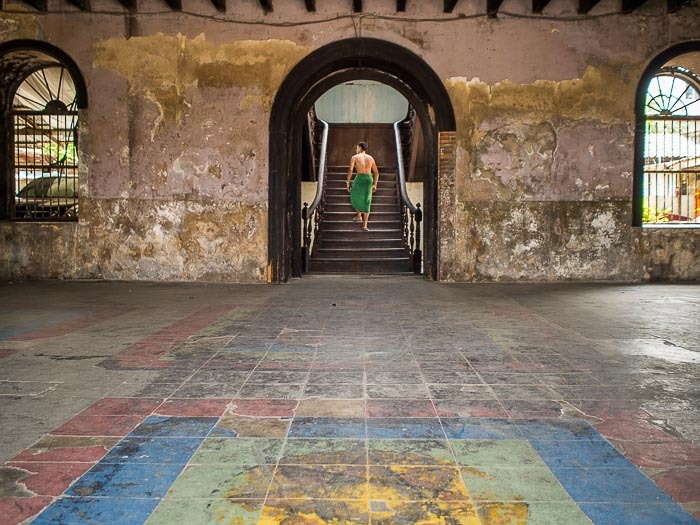 A firefighter climbs the stairs to his apartment after showering on the ground floor of the old Customs House. Despite being closed for almost 60 years, the building retains a good deal of its old grandeur. The Marine Fire Department / old Customs House sits on prime real estate along the Bangkok waterfront. The French Embassy is just meters away - the north wall of the embassy is the south wall of the Fire Department. Very high end hotels line the waterfront but none of them have the architectural panache of the Customs House. The facade of the old Customs House, now the Marine Fire Department headquarters and barracks. Rumors have been swirling for years that the Fire Department will be kicked out of the building and that it will be renovated into a high end hotel. It's not clear if the building, which is gorgeous but in pretty rough shape, will be saved or if it will be razed and an all new building put up in its place. I went down there to see if the firefighters were still there. 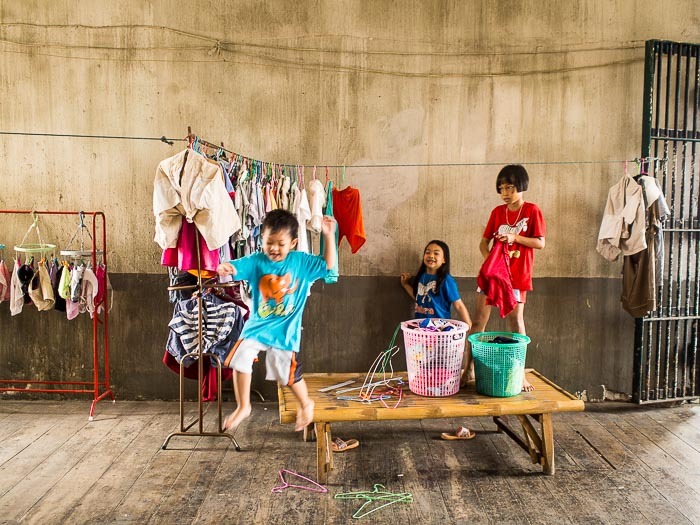 Children of families living in the building hang their laundry on the second floor landing. The firefighters are still there, but there are only about half the families living in the building that lived there the last time I visited, about a year ago. I wandered around for about 90 minutes, mostly photographing architectural details. I was finishing up when I saw a young couple walk into the lobby with a load of luggage. They didn't look like firefighters so I followed them in. The woman was wearing a wedding dress. They had come to the Customs House for their pre-wedding photography session. The photographer they hired followed me in. I introduced myself and we made some small talk. I made a couple of photos while they got ready for the session and then I left because I didn't want to interfere with the photographer they had hired. A portrait of the couple. This is unposed. They were waiting for their photographer to get set up when I made the photo. Chance encounters like this are one of the things I love about photography in Bangkok. The fire department discourages photographers from wandering around the residential parts of the building (I don't really blame them. Would you want tourists wandering through your home?) but the public parts of the complex, like the ground floor foyer and the main staircase are open. I can't think of many places that would allow you to wander into the Fire Department's headquarters relatively freely. Although photography is discouraged, the are no guards or locks, just a couple of discrete signs asking tourists not to enter residential parts of the complex. Sometimes firefighters will take you into the building if you ask them to, but this is more easily arranged if you speak Thai. Wedding, fashion and portrait photographers frequently use the building for sessions. As far as I know there is no permitting process so long as you work in the public areas and don't interfere with fire fighting operations. There are more photos from the old Customs House in my archive.